Forsyth Park is everything we love about Savannah, 30 acres of palms, large oaks, and historic landmarks. And everything we love when we need good variety and sweat: Big open fields for strides and resistance stroller pushes, garden walls for step up and wallsits, park benches, a 1-mile, tree-lined trail around the park and its famous white fountain, plus a huge stage where we get creative with our S.L.A.M. There is plenty of parking on the side streets around the park on Hall, Gwinnett, and Huntindon Streets. You can also park in one of the two park parking lots, though the one next to Forsyth Park Cafe is closest to the playground where we meet. Start with us in the shaded grassy area next to the playground in the center of the park. Located south of Savannah in Richmond Hill, J.F. Gregory Park is family and sweat friendly. There’s a large covered pavilion with picnic tables for pushups, a stage with steps for all kinds of stair work, grassy hills for sprints, and lovely wooded, 3-mile trail for running and more sweating! In the lot at the entrance of the park, you will find plenty of parking. Meet us in the grassy area next to the playground. 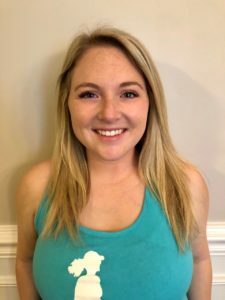 Cassie Cercy is an ACE certified group fitness instructor and is CPR/First Aid certified. She has been living in Savannah since 2012 with her husband, Bryan and sons, Jaxon, Tyson, and Mason. 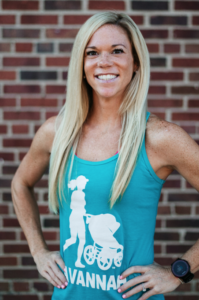 Cassie’s favorite way to sweat like a mother is through sprinting, HIIT and Tabata workouts, and while chasing around all of the littles at the playground after Stroller Strong Moms. Keep Up With SLAM'n Savannah! Join SLAM Savannah on Instagram! 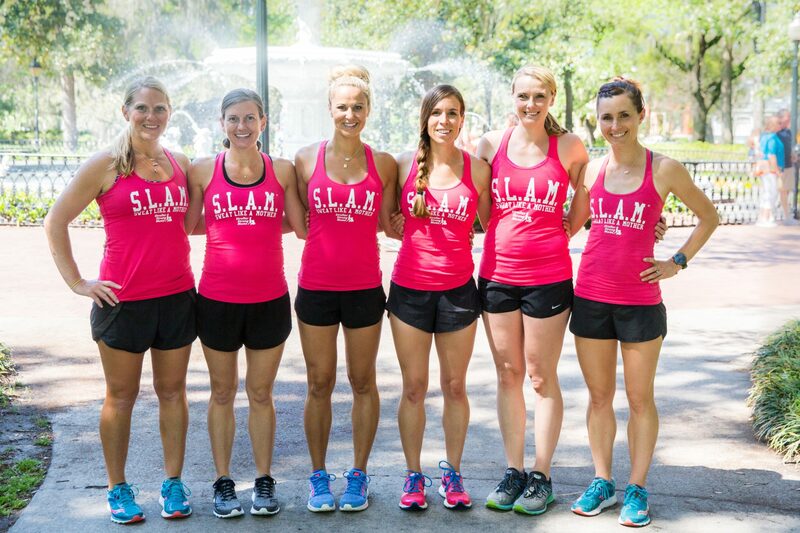 Contact the SLAM Savannah Team! Jenny is an ACE certified Group Fitness Instructor and is CPR/AED certified. She lives in Savannah, GA with her husband, Ben and her daughter, Bailey. She has played sports her entire life and has a love/hate relationship with long distance running, although she loves sprinting and short races too. 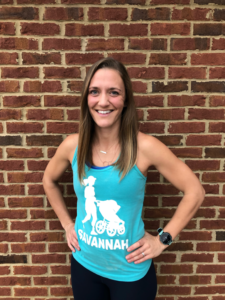 She went through a fitness and running hiatus while pregnant with her daughter and completely credits Stroller Strong Moms for bringing her back, stronger than ever. She is now dedicated to giving back to the SLAM community, so she can help others the way it helped her. Camille is an IFTA Certified Group Fitness Instructor and is CPR/AED certified. She is a military spouse who loves bouncing all over the country with her husband and two kids. She enjoys burning off some steam with a good run. Camille loves to run distance races as well as cheer on her fellow Stroller Strong Moms as they achieve their own goals. SLAM has been the “missing link” for her. She loves the sense of community it brings, all while encouraging mamas to challenge themselves physically, during a mentally challenging season of life. Lisa is an IFT certified Group Fitness Instructor, and is a certified yoga instructor through Yoga Alliance. She is CPR/AED certified. LISA was born and raised in Savannah, GA where she lives with her husband Van, son Will, and daughter Gray. Anything fitness lights up her day! Lisa loves high intensity workouts and found a love for cycling when she was pregnant with her daughter, Gray. 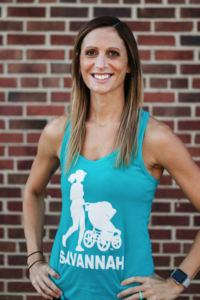 Stroller Strong Moms is much more than a group of moms working out, it is a group of moms who have become moms supporting each other every step of the way to reach their goals. Lisa loves that every mom is out there to better each other and not just themselves. Caroline is a Licensed Master of Social work (University of Texas) and CPR certified. She lives in Savannah with her husband, Joey and son, Lucas. Her favorite way to SLAM is running combined with weight training- pushing herself out of her comfort zone. Caroline loves the loving and encouraging sisterhood Stroller Strong Moms represents.